Written by educator Paulo Freire, proposes a pedagogy with a new relationship between teacher, student, and society. The book is considered one of the foundational texts of critical pedagogy. 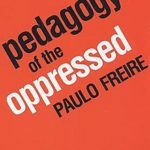 Dedicated to the oppressed and based on his own experience helping Brazilian adults to read and write, Freire includes a detailed Marxist class analysis in his exploration of the relationship between the colonizer and the colonized. In the book Freire calls traditional pedagogy the “banking model of education” because it treats the student as an empty vessel to be filled with knowledge, like a piggy bank. However, he argues for pedagogy to treat the learner as a co-creator of knowledge.